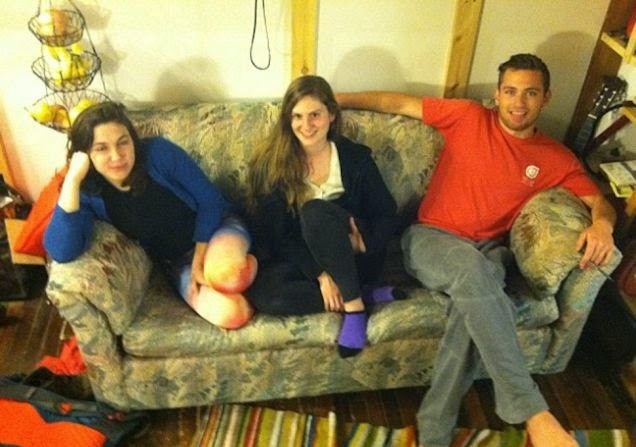 In April, three roommates were watching a movie in their New Paltz, NY home when they noticed several lumps in the side cushions of their new couch, which they'd purchased two months prior from a Salvation Army. Reese Werkhoven, Cally Guasti and Lara Russo rooted through the couch's cushions and pulled out several large envelopes stuffed with $20 bills. "We were just really freaked out by it," Werkhoven told CBS New York. "It had these bubble wrap envelopes, just like two or three of them. We ripped them out and was just like freaking out, like and inch and a half of hundred dollar bills. "You keep counting more and more money and you get excited, like Reese was thinking about buying a car for his mom and a boat," Russo said. By the time the final count was in, the trio had more than $41,000 stacked in front of them. "When we were in the bedroom our neighbors thought we won the lottery or something cause we were just screaming," Guasti said. Plans to buy cars and boats quickly turned to feelings of guilt, though, once they found the name of the cash's owner on one of the envelopes. "The entitlement very quickly went away with finding that notice with her name on it. Because we didn't earn that money," Guasti said. The trio tracked the money's elderly owner down and returned the cash. As you can imagine, the elderly woman was thrilled to have the money—her life savings, she said—back. "This was her life savings and she actually said something really beautiful like 'This is my husband looking down on me and this was supposed to happen,'" Guasti said. The roommates didn't leave empty-handed, though; the elderly woman gave them a $1,000 reward.